Flathead Lake Beach Homes are secluded on Sunny Point at a road's end, amidst an evergreen forest on a gentle beach with a large dock. There is a vast panoramic view of Glacier Park and three mountain ranges. The quiet, peaceful residential area invites relaxation and serenity. Choose from private, fully-equipped beach homes or beach-front rooms with full house privileges. Glacier Park is minutes away, as are other area attractions, including the towns of Kalispell and Bigfork, 12 golf courses, the Big Mountain and Blacktail ski areas, the Summer Playhouse, fine dining, the Bison Range, and lots more. Sailing, boating, lake fishing, horseback riding, rafting, bird watching, fly fishing, and hiking are some of the activities offered. We also have homes on Rollins Bay, near Wildhorse Island. For larger groups we offer a 5 bedroom, 4 bathroom with two kitchens & hot tub 4,000 square foot executive beach home on prime beach across from Wild Horse Island State Park. It may be combined with a neighboring prime beach home (3 bedroom, 1 1/2 bathroom) for very large groups. Juniper Bay has a very affordable 1 bedroom gem about 80 feet from prime level beach with views of Glacier Park and a magnificent panorama. Finley Point Beach home is at road's end on a private cove in Evergreen Forest. Beachfront private rooms available for single nights or longer with full house and beach/dock privileges. Off peak season is October-May; Long term private, value priced beachfront rentals offered. Ideal for relocation to Northwest Montana, artist and writer retreat or sabbatical sanctuary. Have a peak experience at reasonable rates! 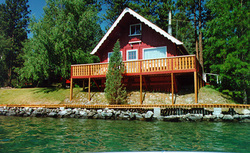 Directions: Flathead Lake Beach Homes is secluded at the end of Sunnyslope Lane, yet it is easy to find. Sunnyslope Lane is off Highway 93, two miles north of Lakeside, and eleven miles south of Kalispell, between the large Mission View terrace sign and Mile Marker 100. Turn east onto Sunnyslope Lane, go down the hill, bear left at the bottom of the hill, bear left at the 'y' (follow arrow,) and then go to the end of the road. The house is a green home with white trim. We also have beach homes on Rollins Lakeshore Drive, at the end of Rollins Bay with views of the Mission Mountains and Wild Horse Island and Silver Salmon Shores, a 5 bedroom, 4 bath 4,000 square foot executive home. Additionally, we offer a private road's end Finley Point beach home and beach cottages on Juniper Bay. Beachfront rooms by the night, beachfront homes by the week.